What Is Fascia And Where Is It Found In The Body? You are here: Home / Massage / Whole Body Massage / What Is Fascia And Where Is It Found In The Body? In a nutshell, fascia is the body´s connective tissue. It is an interwoven system of fibrous connective tissue found all over the body from the head to toe. The connective tissue serves as a framework responsible for supporting and protecting organs, individual muscle groups, and the entire body as a unit. Let us attempt to give you a visual representation of fascia. Let´s consider your skin to be the outer layer of an orange peel. If that´s the case, then, the white, fibrous layer that is located underneath the peel would be your fascia. Therefore, we have a layer of fascia beneath our skin that completely envelopes the body, serving as a protective barrier between the skin and the deeper soft tissue. Fascia enables the muscles to move without obstructions and it plays a pivotal role in reducing friction. As we stated earlier, it is found everywhere including beneath the skin, around bones, muscles, groups of muscles, nerves, organs, cells, and blood vessels. Biologically, fascia is what holds us together. The vitality and strength of your fascia are essential to pristine health and synergy throughout each system of your body. 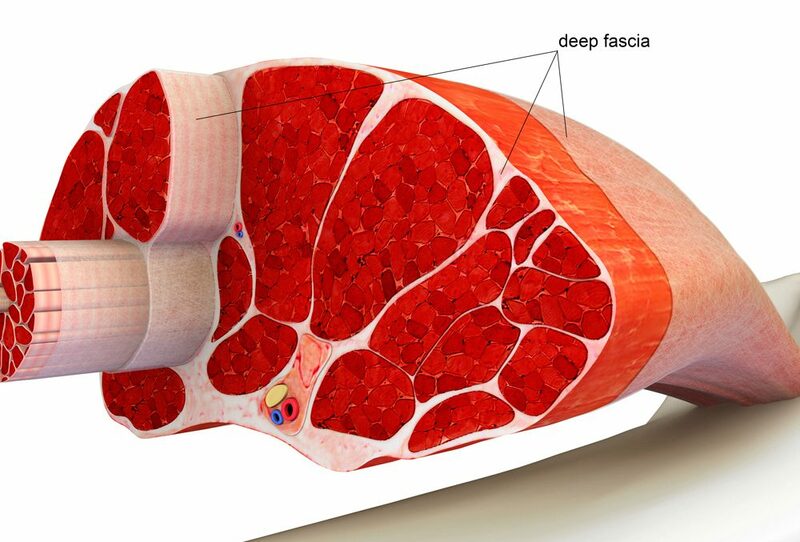 What is the difference between muscle and fascia? Are you hurting your fascia? Is it possible for you to restore your fascia? Since fascia surrounds each organ, muscle, and what not, it provides a protective sheath around the body, protecting the body from outside trauma. It also supports the musculoskeletal system and helps you perform any activity that requires movement including standing, walking, jumping, running, and swimming etc. It helps you sit down! Fascia is also ubiquitous around the blood, muscles, and nerves, and it allows your organs and muscles to move freely without obstructions. Meanwhile, muscle is simply a soft tissue that has the ability to contract, producing movement in or maintaining the position of parts of the body. If you experience fascial adhesions and distortions, this can cause weaker nerve impulses, poor blood flow, and limited range of motion. Therefore, you can bet your bottom dollar that you will suffer from several physical ailments if your fascia becomes weak. The distortions in fascia can play an atrocious role in pulling and compressing the body into malalignment. Even if you experience fascial tension in one particular structure such as the knee, the tension can affect adjacent structures such as the ankle and hip too. When the fascia is tight, it can constrict the nerves and also block off the nerve signal. In addition, a tight fascia can also cause a restriction in the flow of your circulatory system, leading to poor blood flow. Poor circulation leads to a restricted, limited supply of nutrients and oxygen to your cells. If you know a lot about skincare, you should be well aware that the condition of your skin can be largely affected by the state of your fascia. The impact of blood and fascia in ensuring the quality of the skin cannot be overlooked. If you want to maintain a youthful exuberance and have a glowing skin, it is necessary for the two proteins, Elastin and Collage, to be supplied through the blood to the skin frequently and uniformly. Now, the distortion of fascia can largely affect the supply process. And, this, in turn, can cause a decrease in cell turnover and prevent you from having a youthful, glowing skin. Of course, it is necessary to treat our skin from the outside. But, it is more important to understand the processes that occur on the inside, which truly determines the health of the skin. It does not matter if you are the poster child for healthy living. Almost all of us, in one way or another, are negatively impacting our fascia. Even simple, everyday things such as the way you stand, sit, and walk can hurt your fascia. If you have a poor posture, your fascia will have to compensate for the micro trauma in the body caused by the poor form. If you sustain an injury and don´t get it treated and healed properly, your fascia will have to work harder to make up for the imbalance. Although much about fascia is still unknown, we do know that it is possible for you to maintain healthy fascia and restore it. There are things you can do to ensure that your fascia works along with your other systems, instead of against them. It is also possible for you to use a fascia roller to help restore your fascia. It is of paramount importance for you to fuel your body with proper nutrition. Good nutrition is essential for the smooth functioning of the systems and organs in the body. Your body will require proper nutrition to function, repair, and thrive. If you devoid your body of nutrients and vitamins, and instead feed it toxins and harmful substances, it will negatively affect your fascia. We can´t stress enough on the importance of staying hydrated for your health and well-being. There´s a presence of a fluid in the fascia that flows around the cells, delivering and supplying nutrients. In addition to that, the fluid also gets rid of toxins and waste. If you stay sufficiently hydrated, the fluid flows freely and abundantly, helping your body function correctly. This smooth flow of the fluid helps you move around and go about your daily activities without pain. If you want to keep your fascia healthy and strong, it is also imperative for you to maintain a good posture. Poor posture can weaken the muscles and cause micro traumas in the body. Your fascia will then have to work harder to compensate for the micro trauma in the body. You can also do your fascia a big favor by exercising and stretching regularly. Frequent physical activity can promote good blood flow, muscle fascia stretching and activation, neural activity, reduce tension and fascial restriction.